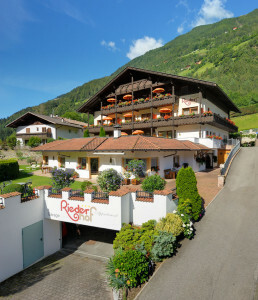 The Riederhof was opened in 1980 as one of the first large hotels in the Passeier Valley with holiday apartments. Although while at that time, holiday apartments in South Tyrol were an exception, the Riederhof welcomed many friendly guests who are still regular visitors today. Apartments Riederhof – where guests become friends! In 2001, the Riederhof was renovated. We added an extensive underground garage, as well as a large lawn area with direct access to our indoor swimming pool. Now, our spacious holiday apartments come with a balcony or terrace, bedroom, kitchen and bathroom.